This is a private group meeting. If you are part of Quilting Peeps, please sign up. This is a four week class for the beginner or a refresher. We start with cutting the fabric of your choice and will end with a completed quilt top. Make six fun kitchen projects in the embroidery hoop! 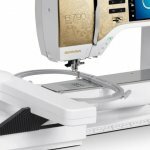 This class is for Rocking Bobbin customers who bought 7 and 8 Series BERNINA sewing machines. If you have a 7 or 8 Series BERNINA and did not buy it at Rocking Bobbin, but wish to take this class, please call us at (972) 803-8400. Bring your laptop with your software loaded, and be ready to learn! We will have hard copies of the workbooks you can purchase. Or bring a USB stick and we will load the workbook on it for free. Come learn BERNINA Embroidery Software with us! Bring your laptop to follow along.